My great grandfather hired out his steam engine for threshing and sod cutting. 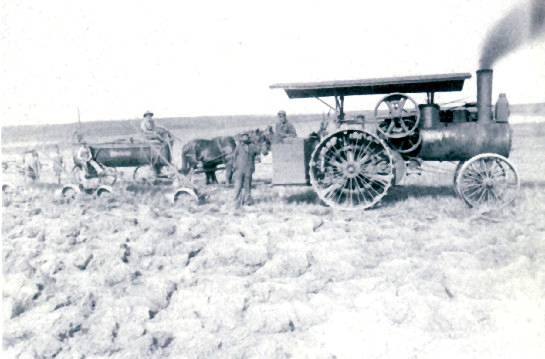 This picture taken in 1902 near Cameron, Colorado shows he and his crew cutting sod. The prairie grasses have deep roots and must be cleared for planting oats, wheat or corn. This entry was posted in Family History and tagged colorado, genealogy, history, Photography, steam engines. The picture of the steam engine and crew cutting sod includes my great grandfather Robert Sidney Foreman. He was born in Time, Pike County, Illinois in 1871. His daughter Mary Frances Foreman married Bernard Floyd Hancock, the son of Nathan Brink Hancock and Lulu Pearl Brace.